Concrete Flow Table offered by us is as per IS: 1199 (for Cement Concrete) and is hand operated. Concrete Flow Table, that we offer, is recommended for concrete where nominal size of coarse aggregates does not exceed 38mm. Our Concrete Flow Table comprises of table top of 762 mm diameter, machined from M.S. and fitted on a heavy duty Cast Iron frame. A cam action provides a free fall of 12.5 mm to the table. 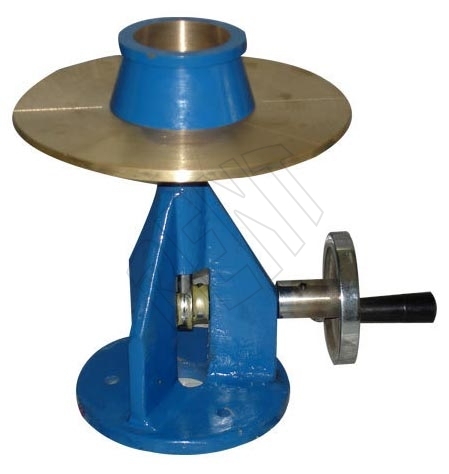 Concrete Flow Table is equipped with a conical mould of 120 mm height with base diameter of 250 mm and top diameter of 170 mm is also provided along with tamping rod 16 mm diameter x 600 mm long.